As Joe wrote in yesterday’s blog post, we are having a work at home day because of the forecasted storm over all of Pennsylvania. Snow day! State College is forecast to have about a foot of snow today, which is a lot for a first real snow of the season. This morning it looked clear and I was beginning to think that we wouldn’t get much after all, then just before 11:00 it began to flurry. By noon, we had steady snow and the beginnings of a lot of accumulation. Here it comes. I am so glad that I can be home today – thanks Joe! – and look at my balcony get slowly buried. I feel so cozy in my warm apartment without having to go out in this. The newscast says it is slick out on the roads, and I send a prayer up for the safety of all the people who have to drive in this storm, especially the bus drivers. I take the bus to and from work, and no matter what the conditions I always feel safe with them at the wheel. We are lucky it isn’t freezing rain, like the western part of Pennsylvania is getting. Snow is tough enough for traveling. My husband Darren is making Hamburger Helper for dinner right now, and it smells great. I have many blessings, including a spouse who cooks so well. I will be doing the dishes after we eat, of course. We also intend to clean the apartment later, which I guess is a good use of a day off work. Where ever you are, dear readers, and whatever weather you are experiencing, I hope you are safe. May you end your day warm and comfortable. Greetings, readers. I asked Rebecca to check when the last top ten list was and on what topic, it was back in April with a list of things I wanted to do this summer. Eight out of ten isn’t bad folks. So here is a list of things I want to do or continue doing in the autumn of 2018. There you have the list, in no particular order. Tomorrow we’ll be back with another stimulating blog entry. So take care, stay cool, thank God this heat wave is almost over, and as always, happy reading. As Joe wrote yesterday, he had a doctor’s appointment today, so I am writing to you again today. It has rained for what seems like forever in Pennsylvania, though it has only been a week or two. The last couple of days the entire state has been deluged, with flood warnings in most counties and weather radar maps full of green. Anyone going outside gets wet, even with umbrellas, it is a fact of life right now. Yesterday, I came home from work with wet slack legs, a soaked umbrella, and damp bags. Last Tuesday, Darren and I unloaded his mom’s groceries from the car in a downpour. It was a relief to get indoors and a grudging acceptance of the weather when we went out. Despite all our trouble and discomfort, I also know we are lucky. State College has areas of flooding, but not rivers of water through our streets. None of us need to be rescued, or are completely blocked off from home or work. It is possible some of the commuters from outlying areas might have those problems, and I wish them well. I look at pictures on the news of cars, homes, towns destroyed by rising water, and I feel grateful and blessed to be dry inside. I see pictures of the wildfires out west and cannot imagine running from a home that might be ash the next time I see it. What does their air smell like, taste like? How do they build a new life from the destruction? There are areas of the country in temperatures over 100 degrees Fahrenheit; I cannot conceive going about my life in those conditions either. As inconvenient as constant rain has been for us here, it could be so much worse. So, wherever you are reading this, I hope you are dry, and cool, and comfortable. I hope you have electricity, and good food, and dry feet. I hope you are as lucky as we are. Until next Wednesday, as Joe would say, take care, have a great weekend, and happy reading. Greetings, readers. I was planning to have a top ten list of my pet peeves today, but I discovered that I had already created the list on August 22, 2012. Well, good news for you, I have another topic in mind and I think it will interest you. Yesterday where I work we got slammed. There was a bomb scare at a nearby business, and all their workers were told that they could gladly come in to our place and spend their down time indoors and out of the rain. They arrived around 3:30 and stayed until almost 7:00. Working the register for me is usually a quiet time in between customers where I can restock things, wipe down tables, and think or meditate. No such thinking or meditation happened yesterday. It was literally non-stop action, and it was good, it gave me an introduction to what the Penn State football weekend is going to be like. We won’t even have time to breath. When Wal-Mart was given the all clear, their workers profusely thanked us, gave us cupcakes, and departed. We thought we could stand down. LOL. I saw a school bus pull in. My manager’s heart sank, and one worker who was already cut had to sign back in. The football team from Tyrone, Pennsylvania was in town for some function, complete with the entire cheerleading squad. I told my friend Tasha, “You work register two and take the cheerleaders. I’ll take the team on register three.” We got them in and out in approximately 40 minutes. Not too shabby. When it was all over, and the high-fives were being given out, I realized something at the same time my manager did. I hadn’t made one mistake. I think it was a combination of adrenalin and being hyper-focused. It was by far the most efficient I’ve ever worked on register. I would like to be that way every day, but I fear that I am one of those people who needs to be pushed to the limits before I shine. After being cut for the evening, and knowing I had just missed a bus, I called a taxi cab. No waiting around for me, my feet were screaming obscenities at me and I wanted to get home. I work another five-hour shift today and then have two days off. I’m looking forward to that quite a bit. On a side note, I’m no longer going to tell you, my readers, what is planned for the next blog, for half the time it doesn’t seem to work out. I can tell you one thing for sure though, I am taking a personal day tomorrow and Rebecca will be putting up the next blog entry with her own topic. Greetings, readers. Tomorrow marks the fourteenth anniversary of my mom’s passing. I was going to do a blog entry to mark the occasion, but realized we did this last year. That entry turned out so well, there was no need to do another one, and it is definitely worth a repeat post. That is something I hardly ever do, though WordPress has a handy feature to copy an entire post, tags and all. It will be linked to Twitter, Facebook, and the Bear Spring Camps Facebook page. Mom, this is for you. Greetings, readers. This is an emotional day for me. I lost my mom thirteen years ago this afternoon, June 15, 2003. It was Father’s Day, and Pop was having an unusually happy Father’s Day. He liked the gift I got him, and we were looking forward to a special dinner. Mom had sent me to the store to pick up an item that she had forgotten. I got the item, had a quick cup of coffee at the coffee stand, and when I got back she was gone. My mom was my dad’s primary caregiver, and after discovering her, I had to go and wreck his world. My mother and I were joined at the hip. After years upon years of having things done for me and having my life made easy, I was now the one who had to help Pop and take over other responsibilities in the house. I was only 37 years old, relatively young to lose my mother, and I faced more years without her than with her. I was indeed able to grow up that summer and I got a lot done, including helping Dad arrange home care and getting myself to Maine for the annual vacation at Bear Spring Camps. I was able to keep the same cabin and do all the same things that Mom and I would do. There was also a touching porch party in her honor which everyone who was in camp came to; only two people had prior commitments. My mom was born in Pittsburgh, Pennsylvania in 1923. We moved from Pittsburgh to State College, Pennsylvania when I was three years old. Mom, a psychologist, had her private practice downtown in an office over a bank. Many a summer afternoon I spent in our car listening to the radio waiting for her to come down from work at 3:00. It quickly became a ritual. Sometimes on a Friday afternoon we would go to Burger King for milkshakes. I would usually get strawberry and she would get vanilla, her favorite flavor. My mom was extremely independent and organized almost to a fault. Every evening she would have the preparations laid for the morning breakfast, so that all she had to do was turn on the tea kettle and oatmeal would be ready in minutes. One thing I didn’t like about my mom was that she despised doctors and would never go to them. She died of congestive heart failure from smoking. If she had been on medication and under a doctor’s care there is a chance that she could have lived a few more years. But she did things her way and she chose how she lived her life. One of my fondest memories of my mom was the song we shared from Percy Faith called “Theme from A Summer Place.” Back in the 1970s there was an easy listening radio station in Waterville, Maine. Every summer going back to camp for the evening, Mom would turn on that station and at least two or three times during those two weeks we would hear that beloved song. I currently have that song on a Spotify music playlist, and I listened to it this afternoon in her honor. I know, I know, I am just sentimental that way. Mom, I said it the day you died and I’ll say it again. Thank you for being the best mom in the world. Here is a picture of my Mom, which we photographed in the frame, since we could not get it out without risking damage to the picture. It might be a little grainy, but you can certainly see her. 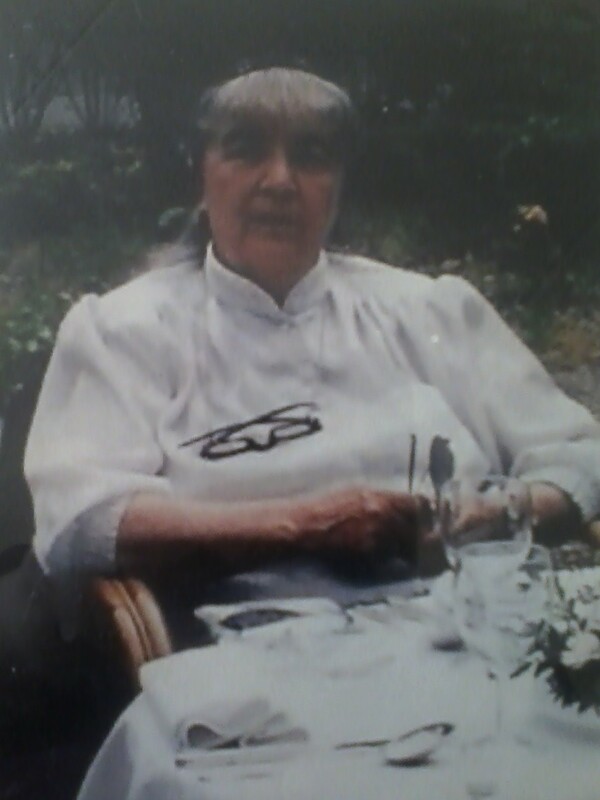 Picture of a picture of Mom from the 1990s, as far as I can guess on the year. June 14, 2017 Rebecca will have a blog entry up sometime tomorrow. I am still having computer issues. There is a slight chance I will be purchasing a new computer tomorrow, and if so I might chime in myself with a small entry giving you details. Wow, perhaps a double entry day. Until soonest, take care, have a great day, and happy reading. Greetings, readers. My personal writing project about the Amish took a kick in the belly yesterday when I discovered a TV series on YouTube dealing with exactly what I wanted to write about. I must learn to not let that deter me. I need to just write what I am going to write, tell my story, and worry about all other details later. If it is meant to work out, it will. I was going to keep this a secret, but my idea was to tell a story about an Amish family which is dealing with either a haunting or a poltergeist. I was so proud of myself, I thought I had come up with something original. Ha ha. I discovered a series called Amish Haunting and thought, so much for my idea. What to do, what to do. I decided not to let that deter me. If I am going to be a writer, I have to get over or get around the first huddle, instead of stopping in front of it. I could barely sleep last night thinking about how I will gather the knowledge needed to do my project. A place that is relatively close to where I live is called the Amish Village. It is in Lancaster, PA. I’m seriously considering renting a Zipcar next Friday and taking Traci for a day trip. Yes, it would be an expense, but it might be worth it to have my questions answered by an actual Amish person. My big question is, would they allow a paranormal team with their high-tech equipment to come into their home to investigate? Another question is, what is the usual response from the Amish community and church to paranormal activity? As usual when I begin writing projects, I can’t seem to get them going. I always jump ahead of myself and either see problems that are still down the line, or I’m not certain how to proceed if an issue crops up. I’m very good at writing the beginnings, and what I want the cover to look like, but not so good at writing the book. I vow to change that. I shall keep next Friday open in case I do decide to take that day trip. If nothing else it will be fun and educational. If I hit pay dirt I shall have the answers I seek. I must be prepared, however, to understand if the Amish don’t wish to speak about such things. Until next Wednesday, I bid you a fantastic weekend, take care, and as always, happy reading. Another short week for us, so if there is no blog entry tomorrow, I’ll try to put one up on the weekend. Until soonest, take care, have a great day, and happy reading. Want to buy some stuff for cheap? Plus, a joke. Greetings, readers. Today I am in one of my fickle moods. Things have not bounced my way since this past weekend. The Pittsburgh Steelers and the Kansas City Chiefs both lost their playoff games, and I didn’t quite get as much reading done on Four’s a Crowd as I had hoped. Before I get into the particulars, I’ll start you off with a joke. Q: Why didn’t Han come out with the rest of the orchestra? A: He was practicing his solo. Okay, okay, I know that was terrible. Hopefully some Star Wars fans will get a chuckle. There are days that I am happy and bouncy and everything is right with the world. Today is not one of those days. I’m still having budget problems which seem to be getting worse not better. And big expenditures are on the horizon. As my girlfriend tells me, we just have to take one day at a time. And she is correct. If I really stopped to think about what was coming up in the next three months, I’d probably go crazy. Hopefully by April, I’ll have my new permanent budget in place and money issues will be better. In the meantime, I’m looking around my apartment to see if I have anything to sell. On a side note, about Keekee’s vet visit last week, I received her vaccination certificate in the mail today. She is now legally healthy for another year as far as the rental office goes. At this very moment, she is staring me down, waiting for her dinner. Tomorrow afternoon, I have therapy at my new day and time, and will have plenty to discuss with Dr. Joanne. After that, I’ll go visit Traci and we will watch something fun on TV. With the Pennsylvania primary coming up in the spring, it’s going to be time for me to take a hard look at the candidates. I loath politics. But if I don’t do my part and vote, I’ll have no leg to stand on to complain if the other person wins. I’ve made a joke to several people that if a certain candidate is victorious in the Presidential race, I’m going to move to Mexico. I don’t think I’m going to have enough money to do that. Most people don’t think that he is going to win though, so that is not going to be a problem. On Friday, I’m going to have a top ten list for you and I’ll dig deep down and make it an extra special one. Tomorrow I’m going to read over several of the top ten lists to make certain that I don’t accidentally repeat myself. Until then, stay warm if you are in the deep freeze, take care, and happy reading.